Immerse yourself in the flavors and scenes of Tuscany with this sunset dinner on a typical Tuscan farm. Departing from Florence, Siena, or Chianti; travel to the farm, located in a medieval village, with a small group of just eight people or fewer. 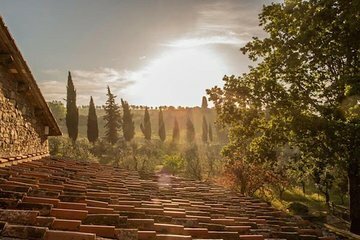 Watch the sunset and indulge in a dinner, accompanied by wine, then visit the ancient town of San Gimignano for an evening walk on the way back to Florence. We believe this could have been a wonderful trip. Our guide was very good and very enthusiastic about the area. On the day of our trip the weather turned out to be very good we were worrying as it had been cloudy and rainy on the previous day and we were looking forward to the trip into the hills. However, the set off time was way too late. We hit a lot of traffic as is the norm - so why not set off earlier!, which meant we hit the small village too late to see the sun set plus all the shops were closing, which meant a 15 minute walk around a pretty village, but nothing else. We then carried on to our Dinner in a beautiful setting - but it was too dark to see anything! When booking this trip at 200 per person, we specifically said that we were pescatarian - reiterated it on more than one occasion. When being picked up we advised our driver that we did not eat meat, but were pescatarian. It was obvious that he was unaware of this and had to ring the venue whilst we were in the village walking about in the dark! On arrival we were served a small dish of chickpeas and lentils - tasty enough, our main course was tomato and pasta! nice enough but not for the price we had paid!, the desert was good. It was obvious that the venue had not been told as I'm sure they would have come up with something more exciting. 3 fairly small glasses of wine to go with the meal - very little explanation as to why they had been chose. All in all a bit of a disappointment.